Personality: Ichigo is a stubborn, short-tempered, occasionally confrontational, spontaneous, determined, outspoken, strong-willed, impulsive young man. Despite being witty and cynical, he is shown to be genuinely compassionate and empathetic about others such as bringing a spirit flowers or soothing others when they become doubtful. He is also extremely protective of his friends and family. This latter trait is the driving force behind most of his actions and almost all of the story arcs have stemmed from him rushing off to save someone, usually females. Backround: Ichigo was born as the son of Isshin Kurosaki and Masaki Kurosaki, 15 years before the main storyline. 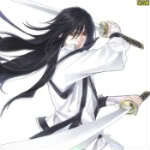 His sisters Karin Kurosaki and Yuzu Kurosaki were born a few years later. During his childhood, Ichigo was signed into a karate class by his mother. In the class, Ichigo met and was eventually befriended by Tatsuki Arisawa, who would beat Ichigo in every match they had. Tatsuki would also help Ichigo if he was being picked on by bullies and cheer him up if he was upset. On June 17th, when Ichigo was nine years old, he was taken home from his karate class by his mother. He saw a girl near the river and saw her falling into it. Concerned, Ichigo ran after to save her, unaware that the girl was really a lure from the Hollow Grand Fisher. Masaki, concerned about her son's safety, ran after Ichigo to protect him, but she was killed by Grand Fisher as a result. Because everyone loved Masaki very much, Ichigo blamed himself for his mother's death and went missing for some time before being found by a very concerned Tatsuki. With the death of their mother, Ichigo, Yuzu, and Karin all changed drastically. Ichigo still blamed himself for his mother's death as time went on. Three years before the main storyline, Sora Inoue was brought to the Kurosaki Clinic from a car accident. Ichigo met Orihime Inoue, Sora's younger sister during this time. However, Sora died in the Kurosaki Clinic. Ichigo risking his life to protect Chad's coin.Ichigo eventually entered Mashiba Junior High School. During this time, Ichigo had finally defeated Tatsuki in a karate match and left the class soon afterwards. Ichigo regularly got into fights with thugs, due to the unusual color of his hair. During one of these fights, he met Yasutora Sado. He mispronounced his name on his name tag as "Chad", and continued to call him as such from that day. They made a pact to protect each other and have remained good friends since. Because of the amount of fights they got into, Ichigo and Chad were given reputations of being gangsters themselves. Ichigo and Chad eventually went to Karakura High School, and their reputations followed them as well, causing a few classmates (namely Keigo Asano) to be nervous about their presence there. During a fight with a gang led by Reiichi Ōshima, Ichigo and Chad met Mizuiro Kojima and Keigo Asano, the latter of which they saved. While Keigo was initially afraid of Ichigo and Chad, both he and Mizuiro eventually became friends with them. Role-play Sample: It was the end of school, as the students of kankura high runs out the entrance in anticipation, Ichigo was the last one out walking with one hand in his pocket and the other carrying his bag over his shoulder with a narrow face as he always does. "What a long day, its time to go home" he thought to himself. 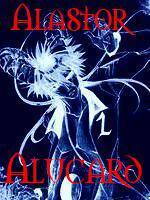 As he walks the streets he remembers the time he first became a shinigami, just the thought of it makes him cringe. As he remember's his sister's was in danger that night and it comes to realized that the reason he became a shinigami was to protect his family and his friends. "I have to win every battle, every enemy in order to protect those who are important to me" he said as he looked up and notices his house was one block away from where he's standing. He walks to the front door with the greeting to his family "I'm home" he greeted them in the same tone he always do then, out of nowhere a uppercut was delivered from no-other than his father: Isshin Kurosaki, whose been giving phyiscal greeting's to his son, for god know's how long. As Ichigo was hit he gets in a arguement wit his father, as they argue for a good ten minutes, Ichigo goes to his room and lays on his bed and just stares at ceiling and slowly closes his eyes as soon that happened he hears a loud annoying sound which was no other than Kon that jumped and landed on his face. "ICHIGO!!! WHERE HAVE YOU BEEN DO YO-" Kon trailed off as Ichigo picked him up by the tail and threw him to the far wall "Damnit Kon how many times must I tell you to shut up....argh forget it, Im going out" he said as he grabbed his Shinigami badge as he did, he shot out of his body in a shinigami outfit as his real body layed there dead "Kon dont do anything stupid while im gone " he said as he opened the window and shot out to the school. Hollow Mask Appearance:First and Second Mask: The mask began with only three stripes, and has since increased. 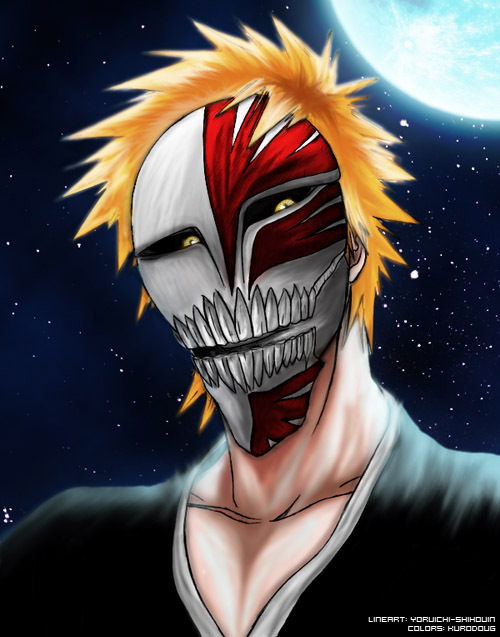 The red/black stripes on Ichigo's Hollow mask changed in thickness after he subjugated his Hollow, covering almost the entirety of the mask's left half during his third battle with Grimmjow. While pure white on the right side, the mask possesses a total of ten red stripes (a total of ten can be seen during his last fight with Ulquiorra) spread across three spots on the left side of his mask.